When owning a business, paperwork comes with the territory. Whether it’s printing receipts, filings your taxes, documenting customers, or filling out inventory, paperwork seems to follow wherever you go. Even as businesses are leaning towards online documentation and saving, many keep hard (paper) copies of certain important documents. The key to these hard copies is organization, which can be hard to accomplish for some businesses. We’ve gathered some of our own organizational tips, as well as scoured the internet for tips to help keep your business organized. Buy A Printer – Finding the right printer to meet your business needs is key to documenting everything you need. If you mostly print in black and white with a lot of copies, then go for a printer with simple printing and an efficient copier attached. By having the right printer for your needs, you are already on a path for success. 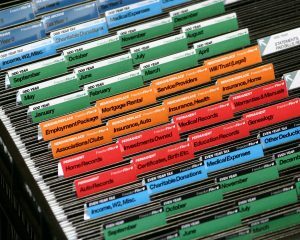 Organize Your Filing System – Whether you have a large filing cabinet, or a small stack of folders, identifying and understanding what goes where is an important part of organization. Some people prefer color-coding for their organizational needs, or you might just want to label everything. As your business starts to evolve, you can cater your organization system to fit your needs. You might prefer having a folder a week or something less frequent like one folder per month. These filing systems can be great for customer contact information or any aspect of your business. Set A Location – When you organize your filing system, find somewhere in your business to center it around. This ensures that you always go back to the same place every time you need to find or add a file. If you have a main office, it would most likely be housed there or if you work from home, you could turn a spare bedroom into an office space. Having one location for paperwork helps to keep things from becoming disorganized and enhances productivity. Don’t Let It Pile-Up – The biggest complaint is “I don’t have time for this right now.” In business, you must stay on top of your filing and paperwork so you can keep your business operating as efficiently as possible. Set a specific time each week to sit down at your desk and maintain all your filing. Use this time to ensure everything is going where it needs to, copies are made and that you’ve added any new folders necessary. There are many other methods of organization that can be added to your regimen as well. If you can keep your printer running and your file cabinet ready to be used, your business stay organized longer and hopefully make you more money. When you begin your spring cleaning and realize you need a better organization system, come to us first and we’ll start you off right with the best printer for your business needs.